This piece is made with satinique cord in combination with waxed cord in silver and black. The length can vary from about 16 1/2 to 19 1/2 inches with a center jeweled piece that adds over 3.5 inches. The first section of the jeweled piece consists of a large glass indigo round surrounded by two fully-faceted black glass rondelles and topped with a beautiful glass turquoise bicone. Hanging separately from this, for added movement and sparkle, is a gorgeous silver foil square, with waves of indigo and turquoise that are lined in black. 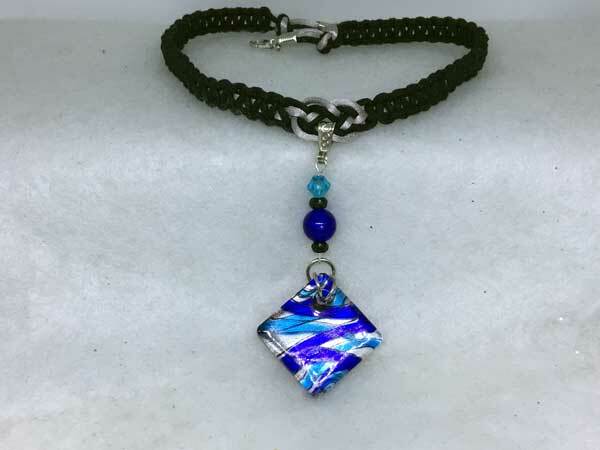 The square hangs on the diamond and the colors coordinate nicely with the beads above it.